Hilton has a very good but not very well known MVP discount program that is valid at participating hotels in the United States (Hawaii included), Canada, the Caribbean, Mexico and Latin America. The rate rules state that the only eligibility requirement is being a Hilton HHonors member. This rate plan, however, is targeted to athletes. The set discount is 20% off of the Best Available Rate (BAR). 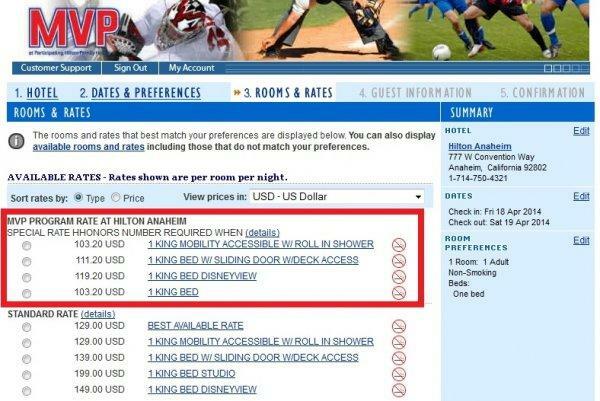 Some hotels don’t have the MVP rate available for all room types, while others do. How to book MVP 20% off discount rate? 1. You can access Hilton’s web page for MVP program (access here). It connects you to Hilton’s Direct Connect booking engine that will automatically populate the fields and will pull up the MVP and some other rates rates (but not all). 2. You can just use the regular Hilton.com search (access here) and use the MVP brand dependent corporate codes below. The advantage of doing the booking on Hilton.com is that you can compare all the discount rates, award nights and Points + Money all at the same time and book the most appropriate for you. The direct connect can display the standard and MVO rate. You can get it to display AAA rates as well, but you have to plug in the entire card number. As you can see, you can display all the rate options including the number of points required for a free night. Hilton Anaheim didn’t have the Points + Money enabled for the date in question. The only requirement is that you must associate the booking with your Hilton HHonors number. The MVP rates are usually very good considering that they are not prepaid, 20% off of the BAR and usually cancellable until 4PM on the day of arrival (remember to check). The stays using MVP rates are eligible for Hilton HHonors points and all the benefits associated with your HHonors status. I have never had had any problems using this rate. As you can see from the rate rules, the only eligibility requirement is to have your Hilton HHonors number on the booking.